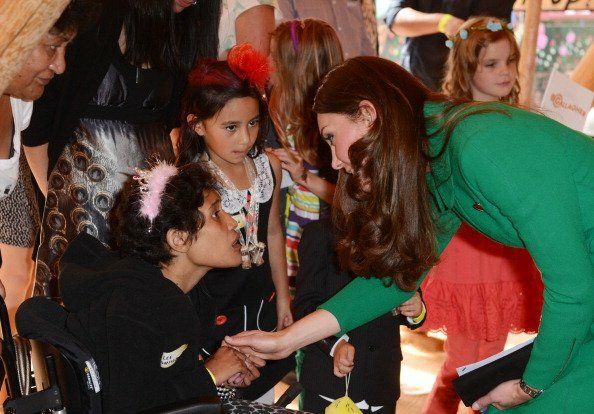 Kate Middleton has visited a children’s hospice on the latest leg of the royal tour of New Zealand. The Duchess of Cambridge was met by more than 40 children and their families at Rainbow Place in Hamilton, the AFP reported. “There should be more places like this,” AFP quoted Kate Middleton as saying of the facility, which provides support for dying and bereaved children. It was Kate Middleton’s first solo engagement on the 19-day tour which will also take in Australia. She met youngsters and parents and had a briefing with the hospice’s chief executive before going to a Mad Hatter’s theme tea party in the gardens. Prince William, meanwhile, was shown around Pacific Aerospace, an aviation firm in Hamilton. He was told about the P-750, an innovative light aircraft made at the plant. “He talked about his friendly brotherly rivalry, with Harry flying Apaches and he’s been flying search and rescue,” the company’s chief executive Damian Camp told reporters. Prince William spent more than seven years in the military and was presented with his RAF wings in 2008. Prince William and Kate Middleton reconvened in the nearby town of Cambridge where thousands of well-wishers lined the streets to greet them. They opened a new velodrome in the town and met some of New Zealand’s cycling, rowing and canoeing elite. And they were handed a tiny cycling jersey in the country’s colors for Prince George, who was not with his parents for this leg of the tour. The tour has seen the royals race yachts, attend a state reception and visit a parent and baby class with Prince George in New Zealand before they head to Australia later this month. Prince William and Kate Middleton’s trip is due to end on April 25 in Canberra.